Can’t put my finger on it…Flashdance maybe? The Inman Mile: Traverse a mile while carrying 150% of your bodyweight on your shoulders. Hydration is allowed and running is optional! Steinborn Lift: Take a weighted barbell standing on end and position yourself against the bar, and allow the weight to fall onto your shoulders and finish in a standing position. Judd Clean and Jerk: A one legged Clean and Jerk. Zeigler Clean and Jerk: A weight plate no smaller than a 2 and 1/2 pound plate is placed on the athletes head and must not fall off during the movement. The plate is not allowed to be attached in any way. Ciavattone Deadlift: A deadlift with no thumbs being used. 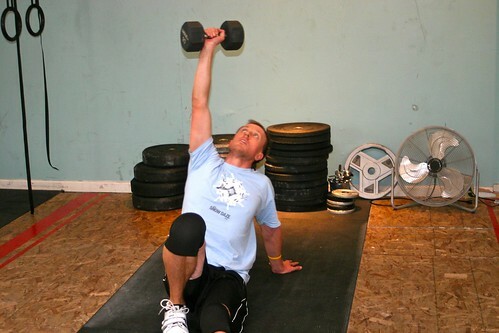 Zercher Lift: A lift from the ground where the bar is in the crook of the elbow.